For reference and discussion of this shader please visit this thread on the polycount forum. The code for light contribution(color & intensity) and shadows are blatantly copy pasted from the TraditionalGameSurfaceShader supplied with ShaderFX in Maya. Did not feel inclined to re-invent the wheel. Author of these snippets? Kees Rijnen? 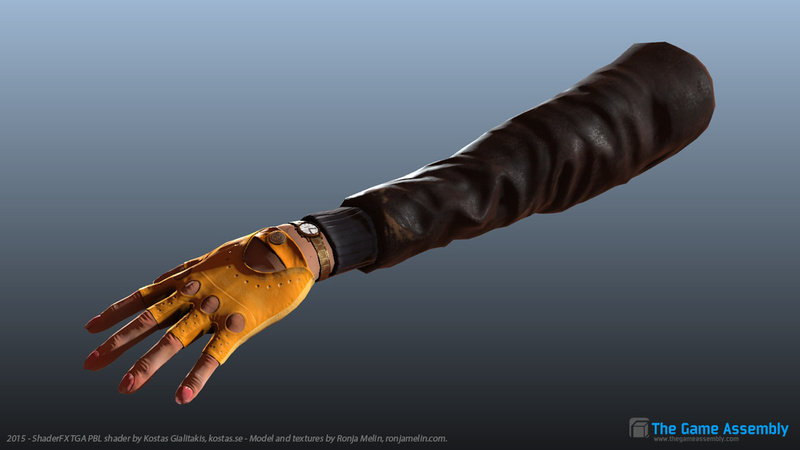 The model and textures of the arm below created by Ronja Melin. Shout out to all the students at The Game Assembly(TGA) for their help in testing and using this shader. Optional Blended Normals diffuse lighting method for skin level SSS-effect along with option mask texture. Shadows with directional and spot lights. User defined amount of Maya native lights in viewport. Exposure and Gamma are tweakable in the viewport in Maya 2015 extensions1 for better overall contrast(not a feature of the shader itself). Supports both full substance texture or metalness approach to define Index Of Refraction values. Easily organized shader network for user defined input textures/colors. Specular/Reflection sharpness/blurriness matched when using Lys(knaldtech.com) generated specular(ggx) cube maps. Optional emissive/full-bright texture to fake light emitting areas. New! You need Maya 2015 Service Pack 5 and DirectX as the renderer for Viewport 2.0(OpenGL is default). You can chance from OpenGL->DirectX under Window -> Settings/Preferences -> Preferences -> Display -> Render engine (at the very bottom). Also, as of Maya 2016 the VP 2.0 defaults to using it’s own linear -> sRGB conversion, set it to “RAW” for intended look. Haven’t found a way to get cube map image size or number of mip-map levels to automatically handle this. User has to manually set cube map resolution/side. Default at 512px/side. Open the ShaderFX editor through the material in the attribute editor. Tip: Use MEL command “shaderfx -update” to easily refresh all the textures in the shader. Tip: Rename the .sfx file to “startup.sfx” and place it into “Documents\maya\ShaderFX\ Scenes”. This will set the shader as the default shader graph to use for new ShaderFX materials.